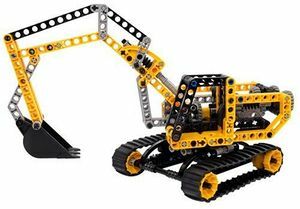 TECHNIC is a LEGO theme primarily based on creating model machines and mechanical toys with specialized beams and connectors. The theme is designed for ages 9 and up, and was first introduced as the Expert Builder series in 1977. In 1984 it was renamed as "TECHNIC". TECHNIC did not introduce gears or cross axles. The first gears were introduced in 1965 and were available only in North America as they were manufactured under license by Samsonite. They had round holes in the centre, as the cross axle did not exist. LEGO released the first European gears in 1970. At the same time, cross axles and bushes were introduced, which are still used in TECHNIC sets today. The first universal joint also appeared around this time. The gears before TECHNIC are much larger and incompatible with those introduced with the TECHNIC theme. 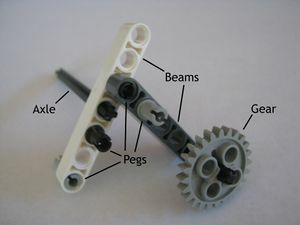 The TECHNIC theme is characterized by the presence of TECHNIC bricks, axles, gears, connector pegs, and many other parts rarely seen in typical LEGO System sets. TECHNIC is still currently an active theme, and is one of the longest-lasting themes in LEGO history. In recent years, System sets have begun to adopt previously TECHNIC-exclusive parts, particularly in Exclusives and Star Wars sets. Many modern sets, including TECHNIC sets themselves, blur the distinction between the two systems to a considerable degree. An example of a typical TECHNIC set. Mindstorms, a LEGO line of robotic products, also uses a large number of TECHNIC pieces, although it is sold as a separate line of products. Both the Mindstorms NXT (August 2006) and EV3 (2013) are based on the stud-less construction method. The four basic TECHNIC components. New (left) and old (right) TECHNIC beams. Beams - Beams are long blocks with rows of round holes. All beams are one stud wide, but they can have varying lengths. They constitute the basic structure of the TECHNIC system. 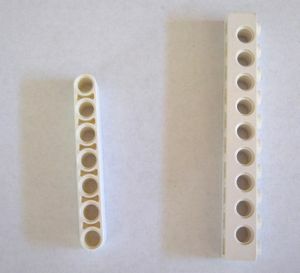 Before 2000, the TECHNIC system used TECHNIC bricks, essentially standard bricks with holes along the sides. Beams are part of "studless construction", which allows TECHNIC models to be more compact. They have rounded edges and no studs. Pegs - Pegs are small cylindrical pieces that latch into holes in beams. The two most common types of pegs are called connector pegs, which join two beams together. Black or blue connector pegs hold the two beams together stiffly, while grey or tan connector pegs form loose hinges. Pegs have also been seen in System sets. Axles - Axles, sometimes known as cross axles, are cross-shaped rods. They are most often used in rotating parts. When inserted into beam holes, they can turn freely. Like beams, axles are measured in stud lengths; axles with even lengths are colored black, and axles with odd lengths are colored grey. There are some specialty axles that are colored differently. Gears - Gears are flat cylinders with holes in the center; most have teeth around the edges. A large majority of gears can fit snugly onto axles. When used with rubber bands or strings, some gears can form pulleys. Most of the modern gears are one stud wide and have peg holes in them. Rubber bands - Rubber bands can have various uses in TECHNIC sets. They can be used for pulleys by connecting two pulley wheels, and can form tire treads if one loops a small rubber band around a single large wheel. Pneumatic - This system mimics real-life pneumatic and/or hydraulic systems by using compressed air to move linear actuators. Springs - Springs are used for shock absorbers and suspension. String - String is used for cranes and winches. Decoration - Decorative elements, e.g. panels, stickers, are used to decorate a model or label controls. The logo accompanying a set. 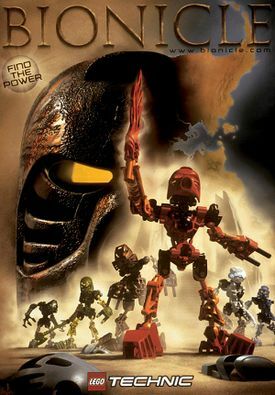 A 2001 Bionicle poster, with the Technic logo at the bottom. TECHNIC has always had a variety of different electric motors. Some are connected via built-in batteries, others use connected battery boxes, and still others run on mainly electricity using a transformer. Most modern sets use batteries. Early TECHNIC motors used the standard 4.5V system, interchangeable with the Trains theme and consisted of a large brick with a small protruding axle. When the motor is activated, the axle rotates. From 1990 onward, this was changed to the 9V system in line with other LEGO themes. The output rotation has a high RPM, but low torque, so it cannot be used to turn heavy objects without additional gears. Later motors contained a hole into which an axle of any length can be inserted. In late 2007, a new motor system was released. It was named Power Functions, and was first used in the set 8275 Motorized Bulldozer. The system consisted of a set of motors, two infrared receivers, a battery box, and an infrared remote control. One receiver would connect to the battery box, and the other would connect to the motors. An example of a Technic Figure. 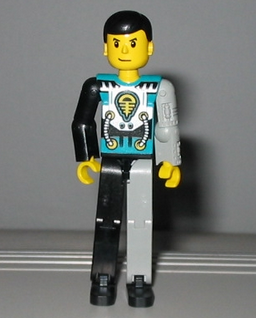 TECHNIC Figures were a form of minifigure that were used in some TECHNIC sets ranging from the mid 1980's to 2001. They mainly appear in the Arctic Action and Competition themes. TECHNIC figures were much larger than conventional minifigures, and had more joints. These were similar to Belville Figures. BIONICLE Technic 2001 poster (it became "BIONICLE" in 2002, officially becoming its own theme). This page was last edited on 15 August 2016, at 12:15.